Lisa Tate is a nationally recognized glass artist. She has studied glass blowing and engraving at the Bay Area Glass Institute in San Francisco, Pratt Fine Art Center in Seattle, and Corning Studio in Corning, New York. 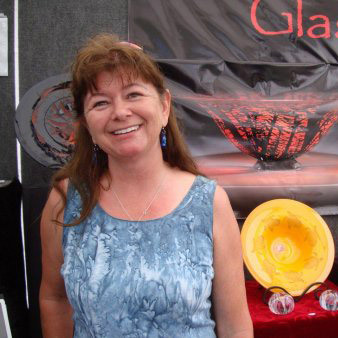 Lisa specializes in blowing glass using multiple layers of color, then cutting through each layer to reveal a design. Her work is collected throughout the United States and the Middle East, and is currently in two permanent museum collections. This rare form of glass combines three major disciplines: glass blowing, designing, and engraving. Lisa has been interested in glass since she was a pre-teen when she started engraving on glass bevels with her fathers Dremel engraver. An avid naturalist and hang glider pilot, Lisa often draws from nature and personal experiences to convey her thoughts and passions in this 2300 degree medium.